Is there any outward evidence that indicates a person loves himself? I suppose the immediate response would be the appearance of confidence and perhaps even a cocky attitude. But is that really loving oneself or is it just a personality type? Confidence is sometimes considered the opposite of shyness. I am certain, nonetheless, that they are not in opposition to each other but rather they are truly complementary. Confidence, as I see it, is not to express one's perceived superiority over others but it is the ability to carry oneself at one's own standard despite others. Shyness, I imagine, is the comfort level that one experiences when sharing aspects of himself with various people. Hence, a person may be shy with one person but not another. It is a trait that, I think, is sometimes confused with humility. Personality traits, however, are not in today's pot of stew. The topic is self-love and what it means. I've mentally tossed this idea around for a while as it was my friend's first piece of advice - love yourself. My first introspective query was and is whether I do or do not love myself and how I would know. I am assured that this advice is legit within an Islamic framework, but how can we say "I love myself" without being arrogant? The quest to love oneself is far beyond the superficial or the obvious. I don't believe it is as simple as saying, "Well people applaud x-y-z qualities in me, so surely these are aspects I should love." People only see a tainted glimmer of partial aspects of us, and those who are honest with themselves are hard pressed to accept such lovable opinions as wholly true. Regardless if they are true or not, laudable traits need not personal recognition in order for one to love himself. I am beginning to understand that to love oneself is to love the quality of life that exists in us. It is to love the potential for excellence that Allah has given us all and to believe that it is a potential worth striving for. By not loving ourselves, we may be inclined to give up on grand opportunities that are in front of us because we don't believe ourselves worthy of them or we don't feel ourselves capable. But life isn't about us, now is it? It's about Allah and nothing else. Perhaps loving the potential to be better is also a tool with which we can fight the lower self (nafs) as it actively calls us to indulge our vile and lowly inclinations. Perhaps it is an untapped force that can actually drive our aspirations to improved states. Love thyself for the sake of your Lord, He who created you in all forms and in the best of forms for an elevated purpose. 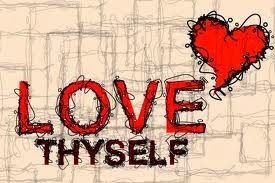 Love thyself and perhaps your purpose can, in the least, be pursued if not realized.